When Buffalo’s Polonia was still a small community attending St. Mary’s and St. Michael’s Roman Catholic Churches, its deceased members were interred at the United German and French Cemetery. This arrangement even continued after the Poles established their own parish, St. Stanislaus Bishop & Martyr in 1873. In the first year, the parish only held 44 funerals and would average 80 a year in its first decade. But as the Polish community exploded in the mid-1880s, the United German and French notified Father John Pitass at St. Stanislaus that they no longer had room for the Poles at their cemetery. Pitass soon began looking for a piece of property to serve as a cemetery for the Poles. He first found a 22-acre farm on Walden Avenue in Cheektowaga that fit his needs and paid a $5,000 deposit. 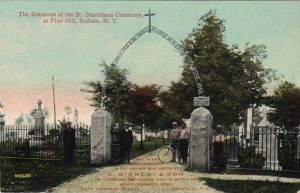 While finishing the transaction, the priest learned of a law that prohibited cemeteries from being located five miles from Buffalo’s city center. With his property being 4.8 miles from the city, he would have to find another location, but not before finishing his purchase. That property would become St. John Gualbert’s parish and its surrounding neighborhood. In 1889, Father Pitass secured the former farm of Samuel Rapin on the east side of Pine Ridge Road in Cheektowaga. The land was prepared to serve as a cemetery but was delayed in being consecrated due to the bishop being ill. To remedy this, when Apolonia Burzynska passed away, her funeral on September 8, 1890 included her grave being individually blessed. A few weeks later, on October 14, 1890 Bishop Ryan formally dedicated the cemetery and burials began promptly. Apolonia was quickly joined by dozens, then scores, then hundreds of neighbors. By the end of 1912, five more acres on the east side of Pine Ridge had been purchased, with another 15 across the street. On June 8, 1913, an estimated 10,000 Poles witnessed Bishop Colton consecrate the last acres of land on east side of Pine Ridge, creating what is known as St. Stanislaus Old Cemetery. At the time of the dedication, St. Stanislaus, Transfiguration, St. Luke’s, St. John Kanty’s, St. Casimir’s, Assumption and SS. Peter and Paul churches all used St. Stanislaus Cemetery for their deceased members. With so many Polish families purchasing plots at St. Stanislaus, the population of the cemetery soon rivaled some of New York State’s smaller cities. By the spring of 1925, 24,368 souls called St. Stanislaus Old Cemetery home. As fewer and fewer spaces were available in the old section of the cemetery it was decided to consecrate the land on the west side of Pine Ridge. For the new cemetery, more spacious roadways were paved with a park-like layout. On Decoration Day 1926, the new St. Stanislaus cemetery was dedicated. Over the years more land would be purchased and property issues would arise, most significantly in the 1960s when New York State was installing the Kensington Expressway. For its project, the state needed 13 acres to cut a trench for the expressway. This required a few residents to be reinterred in other parts of St. Stanislaus and a bridge to be built that would connect the now separated cemetery. In its century-long existence, many of Buffalo’s prominent Poles were buried at St. Stanislaus including: Father John Pitass, Medal of Honor recipient William J. Grabiarz, Dr. Francis E. Fronczak, Congressmen Chester Gorski, Edmund Radwan, Joseph Mruk, the first Polish American mayor of Buffalo, as well as mayors Chester Kowal and Stanley Makowski, football player Justin Strzelczyk, and Polish leaders Jakon Rozan, Wladyslaw Zawadzki, and Jacob Johnson. "10,000 Attend Polish Cemetery Consecration." Buffalo Evening News [Buffalo, NY] 9 June 1913: 11. Print. "Crown Cheektowaga Necropolis of Western New York! Now Has Population of 159,608 ‘Shades.’” Buffalo Courier [Buffalo, NY] 12 Apr. 1925: 58. Print. Drabik, Michael, and Ted Smardz. "Sto Lat - The Polish Genealogical Society of Western New York Salutes St. Stanislaus R.C. Cemetery for a Centennial of Service 1889-1989." Searchers 1 (June 1989): 4-8. Print. Historical Sketch of St. Stanislaus Bishop and Martyr Parish, Buffalo, N.Y. on the Occasion of Its 90th Anniversary = Szkic Historyczny Parafii Świętego Stanisława Biskupa I Męczennika W Buffalo, N.Y. Z Okazji 90-lecia Jej Istnienia. Buffalo, NY: Allied Printing, 1963. Print. "Knights of St. John to Celebrate Field Mass at Pine Hill." Buffalo Courier[Buffalo, NY] 29 May 1926, sec. 2: 9. Print. One Hundred Years of Grace, 1873-1973: Commemorating St. Stanislaus B. and M. Parish, Buffalo, New York, Centennial. Buffalo: St. Stanislaus, 1973. Print. "St. Stanislaus Cemetery." Buffalo Courier [Buffalo, NY] 17 Oct. 1891: 5. Print. 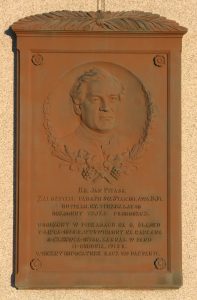 "To Dedicate Polish Cemetery On June 8." Buffalo Evening News [Buffalo, NY] 27 May 1913: 5. Print.